Established plantings made in early autumn can tolerate temperatures to -18 C (0F). When using crimson clover to improve very poor soil, mixing a balanced organic fertiliser into the soil before planting will give better results. Using inoculated seed can also help to grow a vigorous stand. Oats, Rye and Broccoli. Often planted with hardy annual flowers including bachelor buttons and corn poppies. Sow in late summer so that plants can become established before cold weather comes. 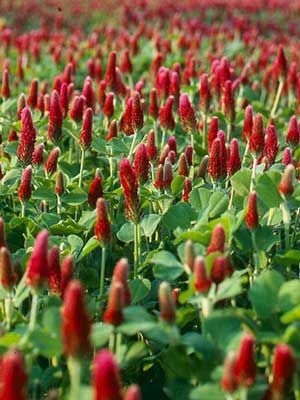 In cold climates, crimson clover can be planted in early spring instead of autumn. Broadcast seed into cultivated soil so that the seeds are about 5 cm (2in) apart and 1 cm (1/2in) deep. No thinning is required.